The latest unemployment statistics paint a bleak picture. Over 10 million Americans have lost their jobs, and that number keeps growing. The national unemployment rate has risen from 6.5% to 6.7%. In some states, however, the situation is even worse. In California and South Carolina, the unemployment rate is a staggering 8.4% and in Oregon, it’s 8.1%. In this tough economic climate, it’s essential to hold on to one’s job. In an economic downturn, some industries fare better than others. Certain sectors actually benefit from a downturn. Budget airlines and budget supermarkets outperform their more expensive counterparts as consumers tighten their belts. In a recession, few people can afford luxuries, but everyone still needs to eat. Cheaper forms of entertainment also do well in an economic downturn. DVD sales have remained strong over the last few months. Buying or renting a DVD is still cheaper than taking the whole family to the movies. If you work in an industry that caters to the budget-conscious consumer, you are less likely to lose your job than if you work for a luxury brand. Companies that produce everyday necessities will still be around a year from now. Those that produce goods and services that people can do without may struggle. How do you know that you’re about to lose your job? Some layoffs are out of the blue, but most often, there are many telltale signs. First, you must look at the economy as a whole. In an economic downturn, no one’s job is completely safe. Even if you work in a growth industry, your company will not be immune from financial troubles. Second, look at the company you work for. All public companies are required to publish quarterly economic results. Read through the reports to see if your company is making a profit. If the company is losing money, it’s likely that you may lose your job. Third, take a look at your department. Have any of your co-workers been recently laid off? If someone leaves, is he replaced, or does the position remain unfilled? In both cases, it’s a sign that you may be next. Even if your department is fully staffed, your job may not be safe. Pay close attention in department meetings. Is the budget for your department being cut? Those savings are going to have to come from somewhere. It’s likely that some people will lose their jobs. Video: What can you do to protect yourself in an economic downturn? 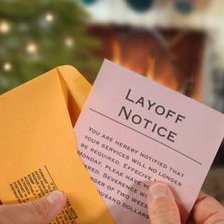 Even if you work for a company that is planning layoffs, there are things you can do to increase your chances of keeping your job. A recession is not the time to start slacking off. Make sure that your boss sees you working hard, but do not show off. Showing off may draw resentment from your co-workers. They, too, may be worried about losing their jobs. If you excel too much, they may try to sabotage your position in the company. Don’t complain about your job or criticize your employer. Remind yourself that you are lucky to have a job in a recession. If you don’t want to do the work, someone else will. Find ways to make yourself indispensible. When was the last time that your boss said, “What would I do without you?” If you can do your own work, plus help your boss do his, he will do everything in his power to keep you. Come up with creative ways to cut costs. If you can save the company money elsewhere, they will be less likely to eliminate your position to save salary costs.